The English bulldog is a popular bulldog breed, not only for its unique appearance but also its charming demeanor. While the English bulldog is unique in appearance, it also has some distinct nutritional requirements you must consider as a loving owner. A balanced diet is essential to keeping your pet healthy, so make sure you are choosing good dog food for English bulldogs, because the right English bulldog diet can go a long way in preventing health issues. Poor diet coupled with a lack of exercise can over time lead to a fat English bulldog as well as joint issues and respiratory problems. English bulldogs are also prone to allergies, especially with respect to certain food additives and ingredients. Any commercially available food specific for English bulldogs will avoid these ingredients, so keep your eyes out when you make a purchase. When choosing the right food for bulldog breeds, consider the following nutrition and buyer’s guide. Choosing the best food for English bulldogs does not have to be difficult, but you should put some time and effort into balancing your dog’s nutrition for optimum health and well-being. English bulldogs are not only known for being strong and muscular, but also known for gaining weight quickly when given the wrong nutrition. The right food for bulldog breeds will allow your pet to flourish, giving your pet the energy necessary for optimum physical fitness, health, and well-being. 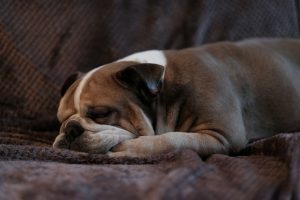 If you want to avoid raising a fat English bulldog, it’s more than just feeding it any typical commercial dog food, walking your dog occasionally, and hoping for the best. You should seek out well balanced food for English bulldogs, something specifically formatted for the breed, or something that has been considered to have the right nutritional makeup to meet the needs of your breed. Consider the percentages of protein, carbohydrates, fats, vitamins and minerals, as well as the sources of those nutrients. The right English bulldog diet can be a homemade diet or a commercially available diet that has your specific breed in mind at all times. Consider the following features of commercial dog food when determining whether or not a specific food will meet the needs of your English bulldog. Proteins are the foundation for all dog food, and the same is true for the best food for English bulldogs as well. Feeding your English bulldog should involve a high percentage of protein, such as beef, fish, turkey, lamb, and chicken. The source of protein is as important as the quantity of protein, so look for all-natural meats, raw meats, muscle meats, and filler-free meats, in foods such as Royal Canin Adult Bulldog, Earthborn Holistic Great Plains Feast Grain Free, Fromm 4-Star Grain-Free Surf/Turf, Artemis Fresh Mix Adult Dog Food, and Canidae Life Stages Dog Food for quality results. Carbohydrates must be closely monitored in English bulldog diets. Foods high in the wrong carbohydrates or are sugary can lead to allergy issues, especially those containing soy, grains, wheat, or corn. It is also recommended that you feed your dog twice daily in smaller amounts to regulate sugar levels. The best English bulldog food will avoid the wrong types of grains or will be free of grains entirely. Some examples of quality English bulldog diets worth considering include Earthborn Holistic Great Plains Feast Grain-Free Dry Dog Food, which is vitamin-enriched and free of grains, and Solid Gold Wolf Cub Bison and Oatmeal Puppy Formula, which is rich in superfoods including pumpkin and cranberries. This brand specifically avoids all known English bulldog allergens. Any food you purchase for your English bulldog should have a lower fat content, ideally between 8% and 15%, ensuring a shiny coat and healthy skin, while still maintaining a healthy body weight. Healthy body weight is something you need to be mindful throughout the life of your English bulldog. Some solid choices here, when seeking the best dog food for bulldogs would include Wellness CORE Natural Grain Free, Natural Ultramix Adult Dry Dog Food, and Nulo Adult Grain Free Dog Food. Make sure to read the label to check the fat content of any commercial dog food you’re considering. Vitamins, minerals, and other supplements are essential to boosting the health of a dog that has inherent health concerns. Certain dog food for English bulldogs will stand out from the others because they add vitamins and minerals to the food specifically to suit the unique challenges of the breed. These include but are not limited to, Taste of the Wild Grain Free High Protein, Natural Ultramix Adult Dry Dog Food, and Earthborn Holistic Great Plains Feast Grain-Free. These commercially available foods are enriched with vitamins and minerals such as C, E, omega 3, and omega 6 to boost your English bulldog’s immune system. The English bulldog is prone to a couple of different health problems, including brachycephalic syndrome, bladder stones, food allergies, and gastric torsion. Brachycephalic syndrome is essentially an anatomical abnormality that lead to restrictions in how the dog breathes. Bladder stones can be reduced with the right nutrition. Food allergies, when they are left without treatment, can make it difficult or impossible for your English bulldog to absorb the required nutrients. To meet your bulldog’s nutritional needs, you need to choose a high-quality dog food designed for the breed, one that provides the right nutrients from ideal sources in the specified quantities. There is no reason why you can’t stave off the most common health issues the breed faces while elongating the average lifespan of the English bulldog. By choosing high quality food you will improving your pet’s quality of life. 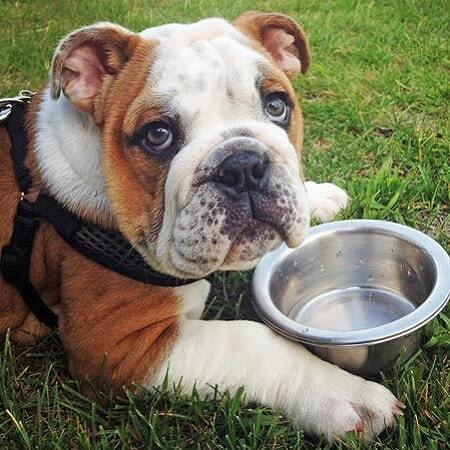 Choosing the best dog food for your English bulldog can be a daunting task. The right nutritional fit for your dog will improve his or her quality of life and help troubleshoot some health issues common in the breed. The choices on the market can be overwhelming. Some common questions about dog food include the type of meat it contains, the nutrient content of each group (proteins, carbohydrates, and fat), and different vitamins and minerals. This review of the Top 8 best dog food for English bulldogs compares those elements and will help you determine which is the best match for the particular needs of your dog. Blue Buffalo is one of the most reputable dog food manufacturers on the market. It prides itself in always featuring real meat as the first ingredient. Blue Buffalo Life Protection Formula is no exception. It is designed for adult dogs and promotes a healthy diet based on natural ingredients with the addition of vitamins and minerals. 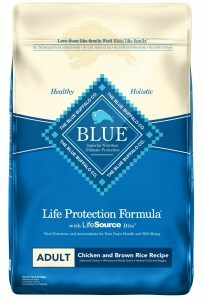 Blue Buffalo Life Protection is a great dry dog food for English bulldogs unless your dog needs a grain free diet, due to the presence of brown rice, barley, and oatmeal. Rachael Ray dog food offers recipes based on wholesome ingredients, including high-quality proteins combined with vegetables and added vitamins and minerals. 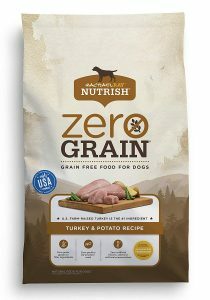 Rachael Ray Nutrish Zero Grain is designed to eliminate some common allergens that affect English bulldogs and make their digestion more difficult, such as soy, grains, wheat, and corn. Rachael Ray Nutrish Zero Grain is a good dog food choice for English bulldogs, particularly if your dog has a sensitive stomach. Royal Canin has developed a line of dog food specifically designed for the different needs of a particular breed as well as the different life stages of your dog. The Royal Canin Breed Health Nutrition Bulldog puppy dry food is designed for bulldog puppies aged 8 weeks to 12 months. It aims to reduce some of the common issues in bulldogs, including digestion issues, bone and joints issues, skin problems, and excessive weight gain. Royal Canin Breed Health Nutrition Bulldog Puppy dry food fulfills the dietary needs of a growing English bulldog, but the nutritional quality of the ingredients is lower than other dog foods on this list. It is nevertheless an appropriate dog food for an English bulldog puppy. 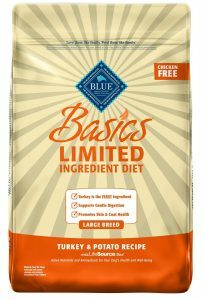 Blue Buffalo Basics Limited Ingredient Diet is designed to avoid common allergens and be as easy to digest as possible, which is a frequent problem for English bulldogs. The formula is devoid of corn, wheat, soy, dairy, and eggs and does not use chicken or beef as a source of protein. It is also a rare dog food to offer recipes with meat from a single animal protein source. The consequence is that this recipe also has a meat content somewhat lower than other dog foods. Blue Buffalo Basics Limited Ingredient Diet is a good dog food choice for English bulldogs who have allergies or severe digestive issues. 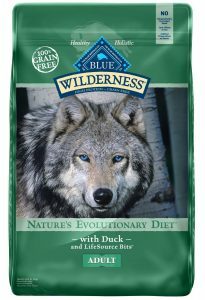 Blue Buffalo Wilderness High Protein Grain Free offers a protein-rich, grain-free diet inspired by your dog’s wolf ancestors hunting in the wild. It includes some uncommon protein sources, such as bison, quail, or venison, and avoids most common allergens including corn, wheat, and soy. It also does not use any poultry by-products, artificial flavors, or preservatives. Blue Buffalo Wilderness High Protein Grain Free is an excellent choice for dog food for English bulldogs, but it might be too rich for some dogs. Hill’s Science Diet is a dog food brand most commonly recommended by veterinarians. It offers highly specialized formulas which account for the size, life stage, and the activity level of your dog. It also aims to resolve common health issues such as weight management, oral care, a sensitive stomach, skin, and mobility.The recipe focus on some easy-to-digest ingredients which do not always have the best nutritional content. 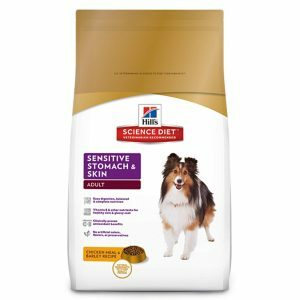 Hill’s Science Diet is a great dog food for English bulldogs with a sensitive stomach. 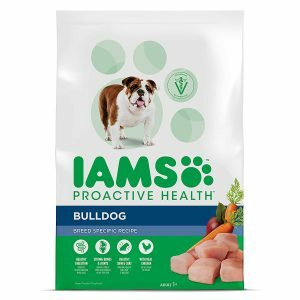 IAMS Proactive Health Adult Bulldog dry food is specifically formulated to fulfill the dietary necessities of bulldogs. It is an affordable alternative that satisfies your English bulldog’s needs. However, the quality of the ingredients used in this recipe can raise some concerns. Corn, which is a common allergen for dogs and considered a filler food with little nutritional value, is listed first on the ingredient list and the main source of meat is chicken by-product meal. Overall, IAMS Proactive Health Adult Bulldog dry food is an acceptable dog food for English bulldogs if you are on a budget. 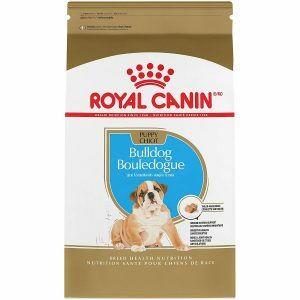 Royal Canin Health Nutrition Bulldog Adult dry food is the next step after Royal Canin Health Nutrition Bulldog Puppy dry dog food. It is designed for bulldogs older than 12 months. It uses the same unique kibble shape which allows bulldogs to grab and eat their food easily despite the unique shape of their muzzle. It also addresses similar potential issues typical of the breed, such has joints, skin, and excessive weight gain problems. 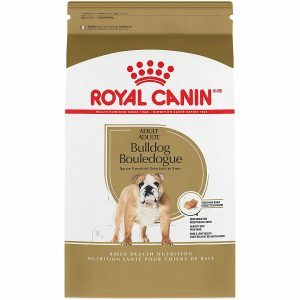 Royal Canin Health Nutrition Bulldog Adult dry food is one of the best English bulldog dry foods if your dog does not have any issues digesting grains. Q/A: Best dog food for English bulldogs: some common questions. We hop the previous comparison helped get a better overview of the different leading dog food diets that fit the needs of English bulldogs. However, some questions still come to mind. Finding the best dog food for your English bulldog is a question of quality and quantity. Keep reading to find out more details to help tailor the best diet for your dog’s need. What dog food is best for English bulldogs? Potential health issues, such as allergies or other difficulties. With this in mind, try to find dog foods using the highest quality ingredients. Avoid filler ingredients that bring empty calories with a poor nutritional value and contribute to potential food allergies. 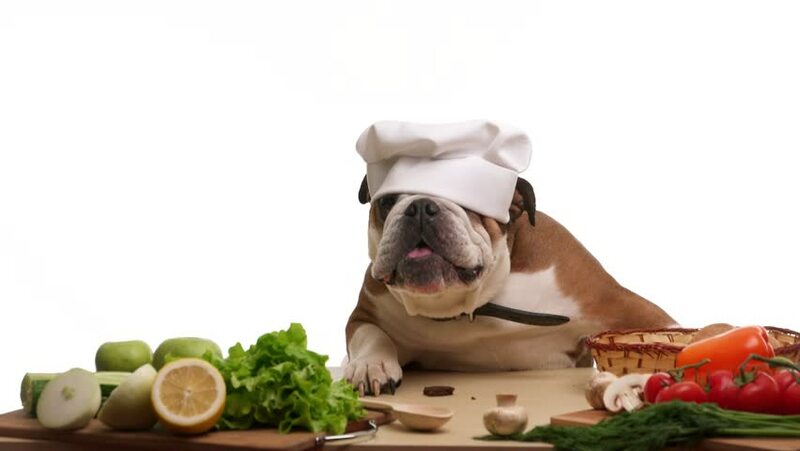 Make sure the recipe you feed your dog has a good balance of proteins, fat, and carbohydrates to keep your dog healthy while avoiding excessive weight gain, which is a common issue for English bulldogs. If your dog has any issues, try introducing limited or grain free diets to eliminate excessive carbohydrates and identify the culprits. Always consult your veterinarian before switching your dog’s diet and do so progressively. Puppies under 12 months have different nutritional needs than adult dogs and should be fed accordingly. Large dog breeds like English bulldogs mature more slowly than smaller breeds. Puppies aged from 8 weeks to 6 months should be fed three times a day. You can switch to twice a day after 6 months. They should receive 20 to 70 calories per pound of body weight in the course of a day depending on their activity level. Since English bulldogs tend to be food motivated and put on weight easily, we do not recommend leaving his or her food out! Table scraps can contain ingredients that are harmful for your dog, in particular a puppy’s sensitive stomach. Keep up with your puppy’s routine veterinarian appointments, it will help you stay on track of his or her growth, so you can adjust his or her diet accordingly. Choosing the best dog food for your English bulldog will help keep your companion happy and healthy and keep some common health issues such as excessive gain weight, skin issues or mobilities issues at bay. While keeping in mind the requirements of high-quality ingredients and a balanced diet focusing on good proteins, Blue Buffalo Wilderness High Protein Grain Free diet is one of the best dog foods for adult English bulldogs. Good alternatives include Blue Buffalo Life Protection Formula and Rachael Ray Nutrish Zero Grain. For the younger canines, Royal Canin Breed Health Nutrition Bulldog puppy is a good dog food for English bulldog puppies. As always, a healthy dose of exercise is a necessary complement to a balanced diet to keep your English bulldog healthy. 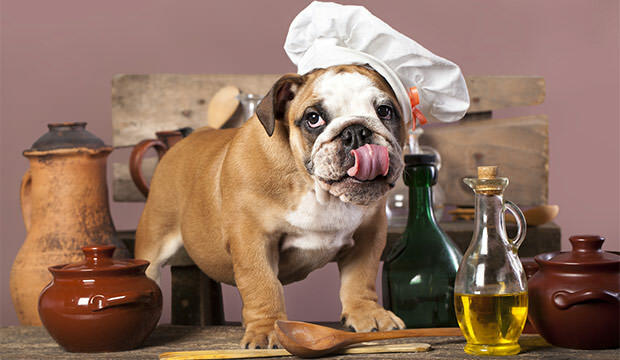 We hope you’ve enjoyed reading this guide for the top dog foods for English bulldogs!